‘Dr Pamela Benito is a Cosmetic Dentist and Facial Aesthetic Practitioner. Pamela moved to the UK after qualifying as Doctor of Dental Surgery at Madrid University in 2006. While practicing dentistry in London she dedicated two years to training in her passion – Facial Aesthetics. In 2008 she went to the USA where she completed a postgraduate training course in Advanced Aesthetic Dentistry at New York University College of Dentistry. Since then Pamela has continued her professional development in the aesthetics field, training under leading facial aesthetic experts at the prestigious Royal College of Surgeons. 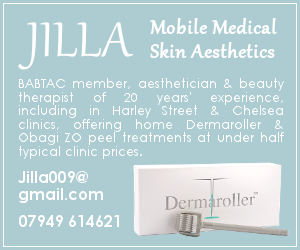 She has completed courses in all aspects of medical aesthetics, including anti-wrinkle injectables such as anti-wrinkle injections, Dermal Fillers, Dermaroller, Chemical Peels, Heart Lips provider, Mesotherapy, PRP, Thread Lifting and Medical Skincare. Pamela is now involved in training other medical professionals and regularly lectures on aesthetic procedures and techniques. She is also active in the setting of standards for practicing doctors within this field. Dr Pam is disarming. Within moments of meeting her I felt like I was chatting to an old friend, albeit a friend thoroughly trained in facial anatomy, with a vast understanding of how injectables can be used to their best advantage. I’d had Botox a few times before; mainly ‘baby Botox’, as in tiny enough doses to slow the formation of wrinkles but still allow a reasonable degree of expression. I didn’t want a huge amount, as, as well as not having visible lines yet, I’d learned from experience that I wasn’t a fan of the corollary effect of raised outer eyebrows and a slight lowering of the mid-centre third of the brow that so commonly comes with Botox. This may sound obscure to the uninitiated, but trust me, even in the best hands in minute amounts, a subtle outer-lift-centre-droop effect is very hard to avoid. However, after explaining this to Dr Pam – wary of over-treating my face or ending up with the dreaded centre-brow descent – she listened and actually followed through in terms of results. I’ve previously had several people ‘totally understand’ what I don’t want. And then go right ahead and do it anyway. And if I’m honest, in my heart of (vain) hearts, I didn’t think it was possible to achieve a smoother forehead without some degree of centre droopage. Even with the most renowned derms in the world, the ageing lift to the outer brow at the expense of the inner had, as yet, been inevitable. Dr Pam somehow (magically?) managed to make my forehead as smooth as a baby’s bottom, while totally avoiding the shape I didn’t want – this was no mean feat. Her understanding of facial anatomy is so sophisticated that if you can explain it she can achieve it! Even more absurd (again, is she… Magic?! ), I, still traumatised from childhood vaccinations and with the pain threshold of an over-tired infant, felt nothing more than gentle stroking as she wielded her syringe (magic wand?). Light-years ahead of the most prestigious dermatologists in the world. I’d previously gone to dermatologists so renowned that they’re household names amongst a certain type of west Londoner. But Dr Pam (dentist by training, but so skilled at aesthetics she now shows MDs how it’s done) has the sort of intangible eye for aesthetics that I’m not sure can be taught. Medics often side-line into aesthetics, assuming a quick read up on Da Vinci Ratio will see them through. Golden Ratio be damned – it may as well be paint-by-numbers in Dr Pam’s presence. I’d actually thought this might be my last ditch dalliance with Botox. I’d found it slightly tightening at best but slightly unflattering in an overall sense, and what’s the point in that? But because all my friends have it as a preventative measure and I didn’t want to be left out, (FOMO is strong kids) I thought well, what the heck. Fast forward a week or so and I saw flawless tight skin with natural movement. I waited and waited for the inevitable corollary effect I was dreading. That thing dermatologists with year-long wait lists told me was unavoidable. I waited, and waited. And I’m floored. Several weeks later my forehead is perfect. As tight as it was when I was 12 and with absolutely nothing I don’t like about it. I literally want to live in Dr Pam’s treatment room forever and ever and ever!